In urban areas, high voltage underground cables are commonly used for the transmission and distribution of electricity. Such high voltage cables have metallic sheaths or screens surrounding the conductors, and/or armour and metallic wires surrounding the cables. During earth faults applied to directly earthed systems, these metallic paths are expected to carry a substantial proportion of the total fault current, which would otherwise flow through the general mass of earth, while returning to system neutrals. These alternative return paths must be considered when determining the extent of the grid potential rise at an electrical plant due to earth faults. For safety and reliable operation, the shields and metallic sheaths of power cables must be grounded. Without grounding, shields would operate at a potential considerably above ground. Thus, they would be hazardous to touch and would cause rapid degradation of the jacket or other material intervening between shield and ground. This is caused by the capacitive charging current of the cable insulation that is on the order of 1 mA/ft of conductor length. This current normally flows, at power frequency, between the conductor and the earth electrode of the cable, normally the shield. In addition, the shield or metallic sheath provides a fault return path in the event of insulation failure, permitting rapid operation of the protection devices. In order to reduce Circulating current and electric potential difference between the sheathings of single core three-phase cables, the sheathing is grounded and bonded at one or both ends of the cables. If the cable is long, double bonding has to be carried out which leads to circulating currents and increased total power loss. Raising the sheath’s resistance, by decreasing its cross section and increasing its resistivity, can reduce this almost to the level of the core losses. However, in case of an earth fault, a considerable portion of the fault current flows through the increased sheath resistance, creating much higher power in the sheaths than in the faulty core. A simple solution, a conductor rod buried into the soil above or under the cable can divert this power from the sheaths. Cable screen controls the electric field stress in the cable insulation. 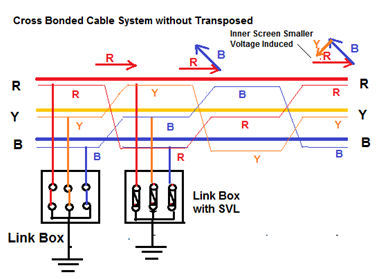 Cable Screen Provides return path for Cable neutral and fault current. If the screen is earthed at two ends than it provides Shielding for electromagnetic radiation. Enclosing dangerous high voltage with earth potential for safety. The electric power losses in a cable circuit are dependent on the currents flowing in the metallic sheaths of the cables so by reducing the current flows in metallic sheath by different methods of bonding we can increases the load current carrying capacity (ampacity) of the cable. It provides low impedance fault current return path and provides neutral point for the circuit. It provides shielding of electromagnetic field. Electromagnetic coupling between the core and screen Electromagnetic screen. 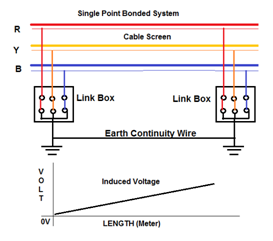 If the cable screen is single point bonded, no electrical continuity and mmf generates a voltage. If the cable screen is bonded at both ends, the mmf will cause circulating current to flow if there is electrical continuity. The circulating current produces an opposing magnetic field. 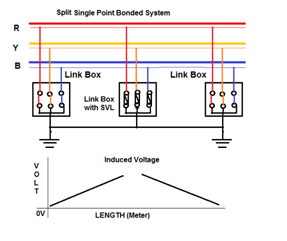 Suitable bonding method should be employed to meet the standing voltage limit and keep Circulating current to an acceptable level. 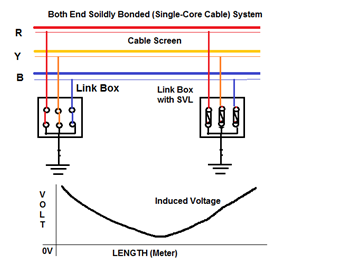 The three Single core cables in a 3-phase circuit can be placed in different formations. Typical formations include trefoil (triangular) and flat formations. To minimize the electromechanical forces between the cables under short-circuit conditions, and to avoid eddy-current heating in nearby steelwork due to magnetic fields set up by load currents, the three single-core cables comprising the three phases of a 3-phase circuit are always run clamped in ‘Trefoil’ formation. This type of Formation minimizes the sheath circulating currents induced by the magnetic flux linking the cable conductors and metallic sheath or copper wire screens. This configuration is generally used for cables of lower voltages (33 to 132kV) and of smaller conductor sizes. The trefoil formation is not appropriate for heat dissipation because there is an appreciable mutual heating effect of the three cables. The cumulated heat in cables and cable trench has the effect of reducing the cable rating and accelerating the cable ageing. This is a most common method for Laying LT Cable. This formation is appropriate for heat dissipation and to increase cable rating. The Formation choice is totally deepened on several factors like screen bonding method, conductor area and available space for installation. For LT application, typically for below 11 kV. Well balanced magnetic field from Three Phase. Induced voltages from three phases sum to zero along the entire length of the cable. Virtually zero induced voltage or circulating current under steady state operation. For HV application, typically for 11 kV and above. Single–core cables neglects the use of ferromagnetic material for screen, sheath and armoring. Induced voltage is mainly contributed by the core currents in its own phase and other two phases.If cables are laid in a compact and symmetrical formation, induced in the screen can be minimized. A suitable screen bonding method should be used for single–core cables to prevent Excessive circulating current, high induced standing voltage.igh voltage. (1) Function of Link Box? Link Box is electrically and mechanically one of the integral accessories of HV underground above ground cable bonding system, associated with HV XLPE power cable systems. Lightning, fault currents and switching operations can cause over voltages on the cable sheath. The link box optimizes loss management in the cable shield on cables grounded both sides. In HT Cable the bonding system is so designed that the cable sheaths are bonded and earthed or with SVL in such way as to eliminate or reduce the circulating sheath currents. There is normally Three Type of Bonding for LT/HT Cable Screen. Standing voltage at the unearthed end during earth fault condition. (2) Both End Solidly Bonded (Single-core cable) systems. Transposition of cables:It is ensure voltages to be summed up have similar magnitude .Greater standing voltage at the screen of the outer cable. 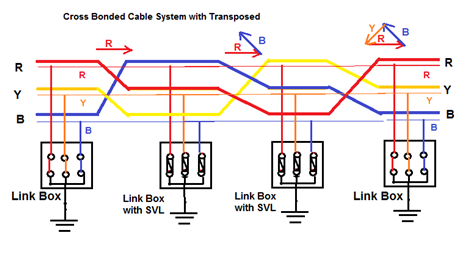 Requirement of transposefor cables core. Size of Cable for Branch circuit which has Single Motor connection is 125% of Motor Full Load Current Capacity. Example:what is the minimum rating in amperes for Cables supplying 1 No of 5 hp, 415-volt, 3-phase motor at 0.8 Power Factor. Full-load currents for 5 hp = 7Amp. Min Capacity of Cable= (7X125%) =8.75 Amp. NEC Code 430.6(A) (Size of Cable for Group of Motors or Elect.Load). Cables or Feeder which is supplying more than one motors other load(s), shall have an ampacity not less than 125 % of the full-load current rating of the highest rated motor plus the sum of the full-load current ratings of all the other motors in the group, as determined by 430.6(A). For Calculating minimum Ampere Capacity of Main feeder and Cable is 125% of Highest Full Load Current + Sum of Full Load Current of remaining Motors. Example:what is the minimum rating in amperes for Cables supplying 1 No of 5 hp, 415-volt, 3-phase motor at 0.8 Power Factor , 1 No of 10 hp, 415-volt, 3-phase motor at 0.8 Power Factor, 1 No of 15 hp, 415-volt, 3-phase motor at 0.8 Power Factor and 1 No of 5hp, 230-volt, single-phase motor at 0.8 Power Factor? Min Capacity of Cable= (26.25+7+13+19) =65.25 Amp. NEC Code 430.24 (Size of Cable for Group of Motors or Electrical Load). As specified in 430.24, conductors supplying two or more motors must have an ampacity not less than 125 % of the full-load current rating of the highest rated motor + the sum of the full-load current ratings of all the other motors in the group or on the same phase. It may not be necessary to include all the motors into the calculation. It is permissible to balance the motors as evenly as possible between phases before performing motor-load calculations. Example:what is the minimum rating in amperes for conductors supplying 1No of 10 hp, 415-volt, 3-phase motor at 0.8 P.F and 3 No of 3 hp, 230-volt, single-phase motors at 0.8 P.F. The full-load current for a 10 hp, 415-volt, 3-phase motor is 13 amperes. The Full-load current for single-phase 3 hp motors is 12 amperes. Here for Load Balancing one Single Phase Motor is connected on R Phase Second in B Phase and third is in Y Phase. Because the motors are balanced between phases, the full-load current on each phase is 25 amperes (13 + 12 = 25). Here multiply 13 amperes by 125 %=(13 × 125% = 16.25 Amp). Add to this value the full-load currents of the other motor on the same phase (16.25 + 12 = 28.25 Amp). The minimum rating in amperes for conductors supplying these motors is 28 amperes. Overload protection (Heater or Thermal cut out protection) would be a device that thermally protects a given motor from damage due to heat when loaded too heavy with work. All continuous duty motors rated more than 1HP must have some type of an approved overload device. An overload shall be installed on each conductor that controls the running of the motor rated more than one horsepower. NEC 430/37 plus the grounded leg of a three phase grounded system must contain an overload also. This Grounded leg of a three phase system is the only time you may install an overload or over – current device on a grounded conductor that is supplying a motor. 130% for motors, found in NEC Article 430/34. Increase of 5% allowed if the marked temperature rise is not over 40 degrees or the marked service factor is not less than 1.15. 115% for motors found in NEC Article 430/32/B/1. Increase of 10% allowed to 125% if the marked temperature rise is not over 40 degrees or the marked service factor is not less than 1.15. 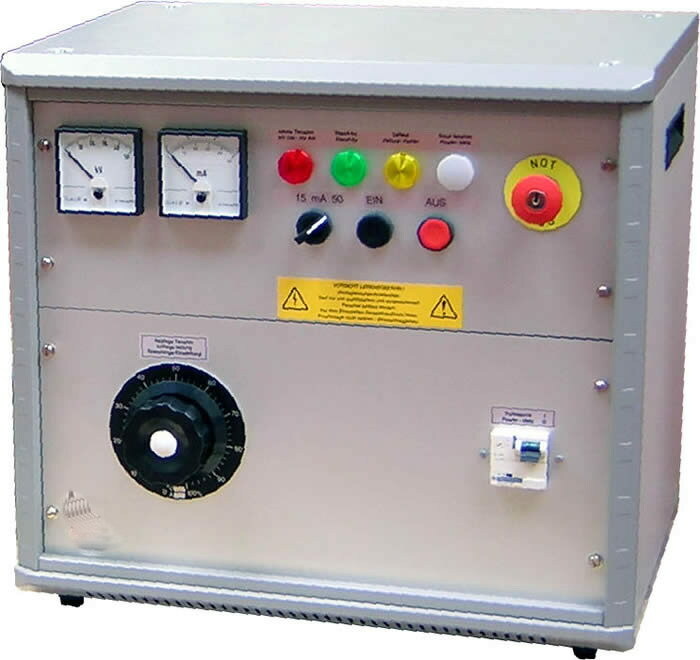 Hipot Test is short name of high potential (high voltage) Teat and It also known as Dielectric Withstand Test. A hipot test checks for “good isolation.” Hipot test makes surety of no current will flow from one point to another point. Hipot test is the opposite of a continuity test. The hipot test is a nondestructive test that determines the adequacy of electrical insulation for the normally occurring over voltage transient. This is a high-voltage test that is applied to all devices for a specific time in order to ensure that the insulation is not marginal. Hipot tests are helpful in finding nicked or crushed insulation, stray wire strands or braided shielding, conductive or corrosive contaminants around the conductors, terminal spacing problems, and tolerance errors in cables. Inadequate creepage and clearance distances introduced during the manufacturing process. HIPOT test is applied after tests such as fault condition, humidity, and vibration to determine whether any degradation has taken place. The production-line hipot test, however, is a test of the manufacturing process to determine whether the construction of a production unit is about the same as the construction of the unit that was subjected to type testing. Some of the process failures that can be detected by a production-line hipot test include, for example, a transformer wound in such a way that creepage and clearance have been reduced. Such a failure could result from a new operator in the winding department. Other examples include identifying a pinhole defect in insulation or finding an enlarged solder footprint. The reason for using 1000 V as part of the basic formula is that the insulation in any product can be subjected to normal day-to-day transient over voltages. Experiments and research have shown that these over voltages can be as high as 1000 V.
Hipot testers usually connect one side of the supply to safety ground (Earth ground). The other side of the supply is connected to the conductor being tested. With the supply connected like this there are two places a given conductor can be connected: high voltage or ground. When you have more than two contacts to be hipot tested you connect one contact to high voltage and connect all other contacts to ground. Testing a contact in this fashion makes sure it is isolated from all other contacts. If the insulation between the two is adequate, then the application of a large voltage difference between the two conductors separated by the insulator would result in the flow of a very small current. Although this small current is acceptable, no breakdown of either the air insulation or the solid insulation should take place. Therefore, the current of interest is the current that is the result of a partial discharge or breakdown, rather than the current due to capacitive coupling. The test duration must be in accordance with the safety standard being used. The test time for most standards, including products covered under IEC 60950, is 1 minute. A typical rule of thumb is 110 to 120% of 2U + 1000 V for 1–2 seconds. Most modern hipot testers allow the user to set the current limit. However, if the actual leakage current of the product is known, then the hipot test current can be predicted. The best way to identify the trip level is to test some product samples and establish an average hipot current. Once this has been achieved, then the leakage current trip level should be set to a slightly higher value than the average figure. The hipot tester current trip level should be set high enough to avoid nuisance failure related to leakage current and, at the same time, low enough not to overlook a true breakdown in insulation. The majority of safety standards allow the use of either ac or dc voltage for a hipot test. When using ac test voltage, the insulation in question is being stressed most when the voltage is at its peak, i.e., either at the positive or negative peak of the sine wave. Therefore, if we use dc test voltage, we ensure that the dc test voltage is under root 2 (or 1.414) times the ac test voltage, so the value of the dc voltage is equal to the ac voltage peaks. For example, for a 1500-V-ac voltage, the equivalent dc voltage to produce the same amount of stress on the insulation would be 1500 x 1.414 or 2121 V dc. The main advantage of the dc test is DC Voltage does not produce harmful discharge as readily occur in AC. It can be applied at higher levels without risk or injuring good insulation. This higher potential can literally “sweep-out” far more local defects. One of the advantages of an ac hipot test is that it can check both voltage polarities, whereas a dc test charges the insulation in only one polarity. This may become a concern for products that actually use ac voltage for their normal operation. The test setup and procedures are identical for both ac and dc hipot tests. A minor disadvantage of the ac hipot tester is that if the circuit under test has large values of Y capacitors, then, depending on the current trip setting of the hipot tester, the ac tester could indicate a failure. Most safety standards allow the user to disconnect the Y capacitors prior to testing or, alternatively, to use a dc hipot tester. The dc hipot tester would not indicate the failure of a unit even with high Y capacitors because the Y capacitors see the voltage but don’t pass any current. Only electrically qualified workers may perform this testing. Open circuit breakers or switches to isolate the circuit or Cable that will be hi-pot tested. Confirm that all equipment or Cable that is not to be tested is isolated from the circuit under test. The limited approach boundary for this hi-pot procedure at 1000 volts is 5 ft. (1.53m) so place barriers around the terminations of cables and equipment under test to prevent unqualified persons from crossing this boundary. Connect the ground lead of the HIPOT Tester to a suitable building ground or grounding electrode conductor. Attach the high voltage lead to one of the isolated circuit phase conductors. Switch on the HIPOT Tester. Set the meter to 1000 Volts or pre decide DC Voltage. Push the “Test” button on the meter and after one minute observe the resistance reading. Record the reading for reference. At the end of the one minute test, switch the HIPOT Tester from the high potential test mode to the voltage measuring mode to confirm that the circuit phase conductor and voltage of HIPOT Tester are now reading zero volts. Repeat this test procedure for all circuit phase conductors testing each phase to ground and each phase to each phase. When testing is completed disconnect the HIPOT Tester from the circuits under test and confirm that the circuits are clear to be re-connected and re-energized. To PASS the unit or Cable under Test must be exposed to a minimum Stress of pre decide Voltage for 1 minute without any Indication of Breakdown. For Equipments with total area less than 0.1 m2, the insulation resistance shall not be less than 400 MΩ. For Equipment with total area larger than 0.1 m2 the measured insulation resistance times the area of the module shall not be less than 40 MΩ⋅m2. If the tester doesn’t meet these requirements then make sure it has a safety interlock system that guarantees you cannot contact the cable while it is being hipot tested. Don’t touch the cable during hipot testing. Don’t allow children to use the equipment. If you have any electronic implants then don’t use the equipment.